Take off Friday before Labor Day and drive 6 hours to Bellingham, Washington after work the night before. 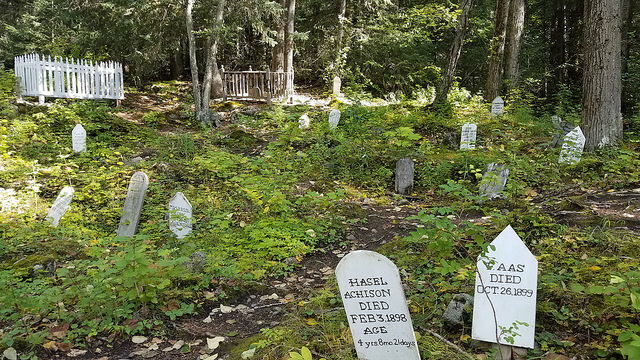 Spend a day-and-a-half self-touring around Whitehorse and vicinity, as well as another cross-border excursion to Skagway, Alaska – making a far easier journey from the two towns than the prospectors had it over 100 years ago. Fly back on Labor Day, get stopped at the border for two hours and make the drive all the way back to our Oregon home. Yep, typically ‘roady fare there. All in a weekend’s work, so to speak. That Friday evening, after touring the S.S. Klondike II (an old Yukon River freighter that is the first thing drivers coming from the south will see upon entering the capital city of the Yukon Territory), I got an table on the outside deck of the Klondike Rib & Salmon restaurant. Yes, despite the damp, 50-something weather, I thought sitting outside within spitting distance of the space heater was a better scene-setter for me. 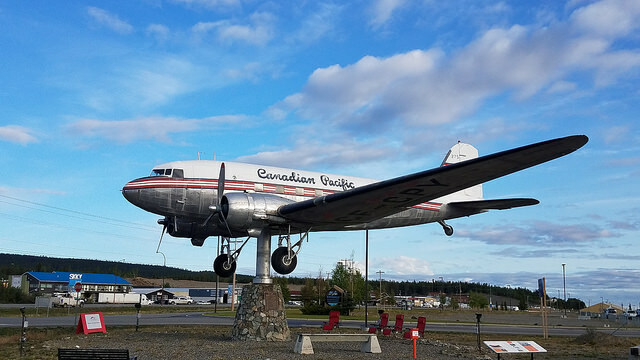 This whole freakin’ plane is a wind vane that sits outside of the Whitehorse airport. If it is particularly blustery day, you may see it facing in another direction. I made chit-chat a retired firefighter from Virginia who was starting on the backend of his cross-country trek to visit his dying uncle in Alaska. Another woman joined in on the discussion, she had driven up from Edmonton to retrace a journey she made with her father over a decade ago. Three solo travelers from three different corners of the continent on the only three tables on this outside deck…basically the perfect end to a great first (half) day in the Yukon. 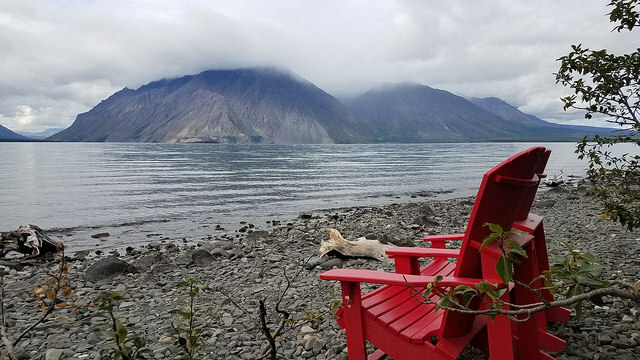 The next day I’d test out my rental car on a stretch of the Alaska Highway, plotting a stop at Haines Junction followed by some time at Kathleen Lake, a picturesque spot on the fringe of Kluane National Park (a UNESCO protected area that is also home of Canada’s biggest peak – Mount Logan). I made the near two-hour drive on the fuel of two Canadian Maples courtesy of Tim Horton’s (yes, you can never stray too far from the Canadian coffee-and-donut chain, even all the way out here) before stopping at the huge visitor’s center for Kluane in little Haines Junction – a town of 613 people literally named for its diversion towards Haines, Alaska on the aptly named “Haines Highway”. The Kluane National Park and Reserve Visitor Centre (combined with the Da Ku Cultural Centre) may be the largest park-related visitor center I’ve ever seen in relation to the size of the surrounding populace (could make for some interesting data crunching investigation for another blog post). After buying a patch and some postcards, I headed for the mosquitoes of Kathleen Lake. 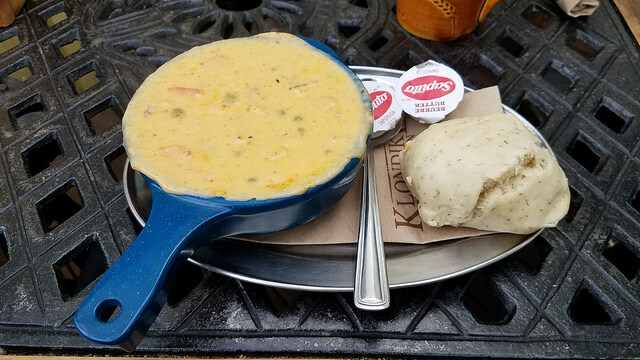 Fish Chowder and Bannock bread at the Salmon and Rib place in Whitehorse…best soup and bread combo I’ve ever had in my life. The U.S./Canada crossing en route to Skagway actually occurs away from the real border as the logistics of hosting two stations in the same place on a winding mountain pass makes no real sense. You pass the Canadian office and are essentially in a “No Man’s Land” where you can feasibly make the trip to the Alaska welcome sign and drive back to Canada without reporting in the U.S. (I have a really good feeling that explanation wouldn’t fly on your official return to Canada). In this strange geopolitical anomaly, I actually caught a glimpse of the famed White Pass and Yukon Route tourist train making its way to Whitehorse, surely bundled full of cruise tourists who had landed in Skagway earlier that morning (I actually picked Sunday instead of Saturday for this drive because of two reasons – good weather and one less cruise boat docking that day). 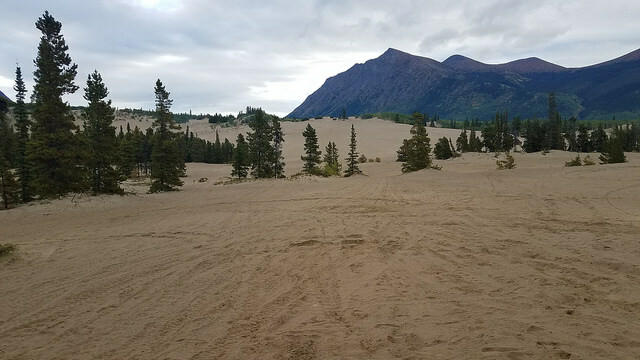 This is the Carcross Desert, which is actually a dried up lake bed and not a true desert. Still, it looks a bit funny up in the Yukon. 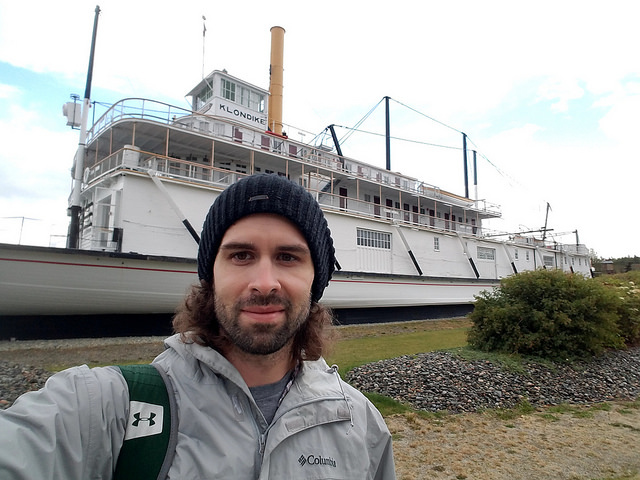 I did have a bit of fun being the “different tourist” in Skagway that day (I counted at least 3-4 times when I was asked if I ‘came from the ship’). I’m just the American who drove to Vancouver a couple days ago, flew to Whitehorse and then took a Yukon-plated rental to Skagway, don’t mind me. 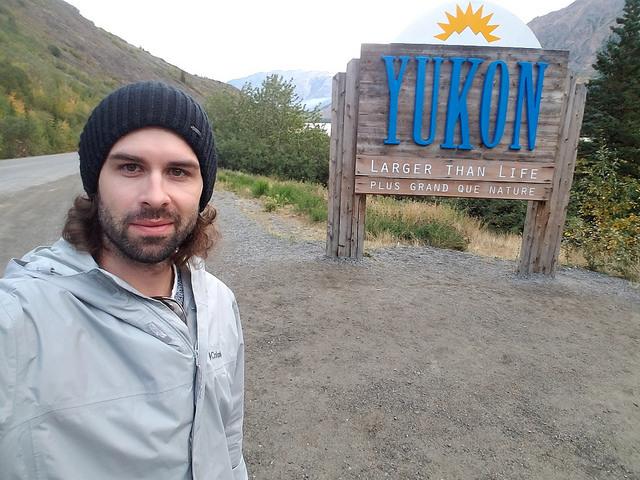 My first stop was the Klondike Gold Rush National Historic Park (of course). I love national park sites, but the most awkward part about it is encountering the ranger for the first time – I feel I always have to have SOMETHING to say to warrant my interest in being there and half the time it always comes out so corny. “Ahh, Klondike National Park,” I say, as if I just discovered this spot without any prior knowledge. “I’ve actually been to the one in Seattle” (referring to the unit of the same park housed some 1600 miles away). I mean, why can’t I just own it? “I’ve been the the unit in Seattle because I’m obsessed with parks partly because of your passport stamp program!!! AHHH YOU GOT ME HOOKED!!! And now I’m here, and after this I’ll be there and there and there….” Well, probably because I’d sound like either a prick or a crazy person. The ranger kindly congratulates me on now “visiting the other half” and I move on through the museum, satisfied that the encounter didn’t turn out so awkward for me. I got some flan at the Filipino restaurant, played the part of a typical tourist and picked up some cheap souvenirs at the Alaskan T-Shirt Company shop (a mega mart of souvenirs in a town that doesn’t even have 1,000 full-time residents) and ambled through the rest of historic gold rush town, enjoying t-shirt weather on a day that hit a beautiful 67 degrees in the warm sun. 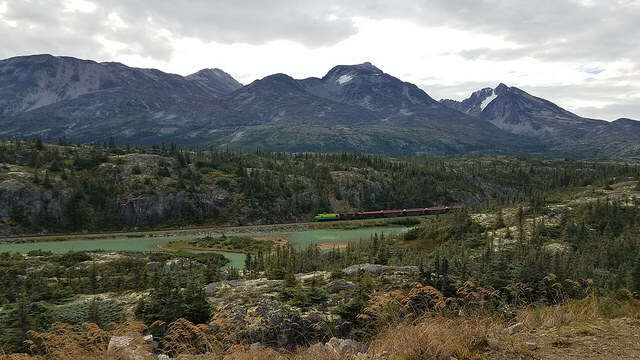 Learned a bit about the harrowing conditions of the Chilkoot trail, a bit about the aforementioned train I saw early and a bit about a guy with one of the coolest names ever (Skookum Jim) who happened to set this whole rush in motion with his discovery. Apparently this is the most photographed building in Alaska? 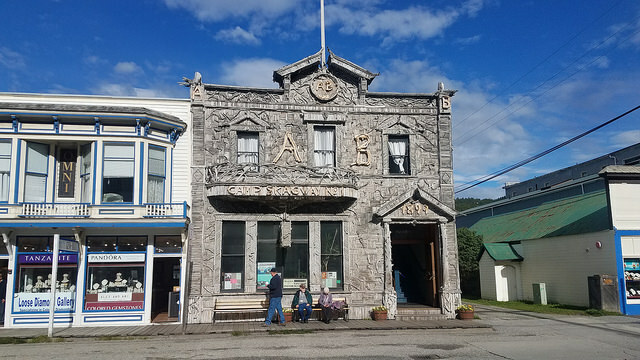 This is the driftwood facade of the Arctic Brotherhood Hall – it is now the main visitor center in town. 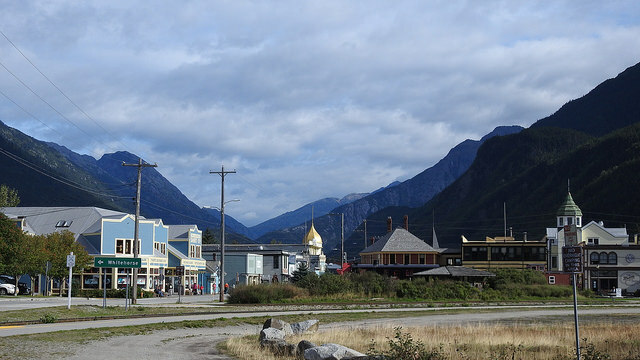 Never made it down to Skagway. I hope I can correct that soon. These pics look beautiful. Thanks Daniel! I suppose I’d suggest doing it around the time I visited, as it seemed a bit quieter as the shoulder season encroached. Cruise boats keep visiting through the first weekend of October. I imagine the place is quite sleepy during the winters, could make for a unique time to get over there. What was the 2-hr border delay all about? Did you get harassed, or were the wait times just that long? Anyway – well worth the time and effort! Heck of a way to spend a quick holiday weekend. I’ve been through Whitehorse twice and Haines Junction 4 times on some to-and-fro Alaska road trip journeys. I still keep Whitehorse as one of the ‘pre-set’ weather locations on my iPhone app so I can see what the temperatures there are like from time to time. 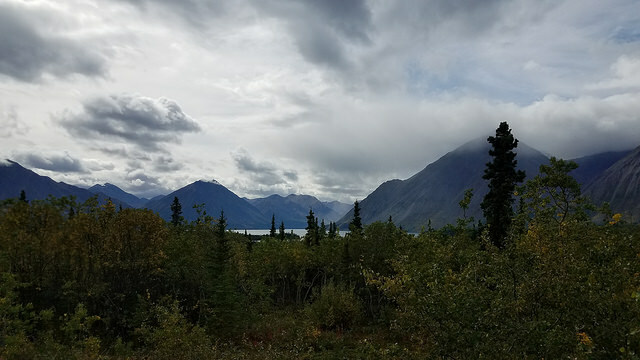 Kluane has some sweet scenery. I stopped and parked in the middle of a bridge there for a photo – it was that remote and scenic. Now, free food on Air North? Awesome! Thanks for sharing the adventure. Tyson – would love to take that drive you’ve done, I remember reading about it on your site…sounds so epic. I’m not sure why I was stopped – though they had me actually go into the station and I had to wait in line to get my car searched. It was also right over lunch hour, so very few agents were on duty. I knew I was good, but I must’ve raised a red flag with my multiple border crossing trip (in a very short time period no less)…who knows?